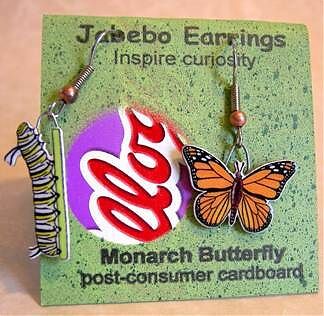 Judi's Butterflies: Come by for our Open House! Come by for our Open House! There will also be complimentary refreshments, and goodie bags and small gifts for children ten and younger (so don’t accidentally forget your children :), and free raffles! Tours, plants for sale, and take pictures! We will also have limited supplies of butterfly plants — both host and nectar — for sale, and a limited number of eggs or caterpillars for some species for those who buy host plants, or already have a host plant at home! Plants, eggs, and caterpillars are all products of Judi’s Gardens. But you don’t need to buy anything to drop by and take the tour. Or enjoy the refreshments. Please come by! We want to meet you. 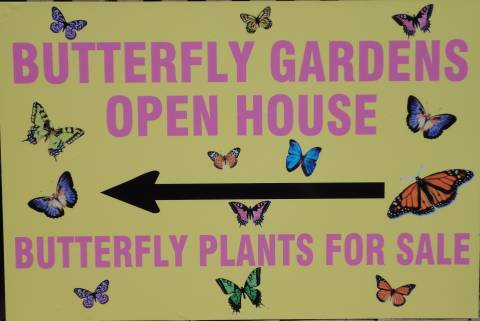 We’ll be on hand to talk about the amazing butterfly life cycle, butterfly plants, what you can do if you want butterflies in your yard, how good a glass of lemonade is on a hot day, and whatever else you might want to talk about. Remember, you don’t need to buy anything to drop by and take the tour. Or enjoy the refreshments. Please come by! We want to meet you. Be sure to bring your camera and take pictures. And did I mention refreshments? Directions from anywhere north of Palm Bay Road, or from West Palm Bay. Directions from anywhere south of Malabar Road in Palm Bay, or anywhere south of Palm Bay at all, for that matter. Get on Emerson heading east from Minton Road. Either way, from the north or the west, you’re now heading east on Emerson into the Lockmar subdivision. Drive through Lockmar on Emerson until you pass Fred Lee Park and cross the Tillman Canal. Start looking for the signs (see photo above)! If you get to Americana Blvd (barely a hundred yards), you missed the signs! Turn around and head back. Heading north on Emerson, *as soon as you pass Americana Blvd (there’s a little convenience store on the corner), start looking for the signs (see photo above)! If you get to the bridge over the Tillman Canal (barely a hundred yards), you missed the signs! Turn around and head back. Thanks to Brent and Sharon at Maple Street Natives, for publicizing the event by handing out our leaflets; and especially Teresa at Rockledge Gardens for mentioning us in her E-Leaflet newsletter. And thank you to Busy Bee Lawn and Garden for carrying our leaflets in the Vero Beach area. Please patronize these nurseries — we do! <<The last Open House was a terrific time!